Daniel Davies was born on 18 June 1870 in Rhos Ruabon, Denbighshire (Ddinbych), North Wales, or possibly the 8th. Mary Morris appeared in the British census of 2 April 1871 in Ruabon, Rhosllannerchrugog, Denbighshire, North Wales, at 163 Market Street. Other members of the household included Daniel Davies, Ellis Davies and John Davies. William Parry and Mary Morris appeared in the British census of 3 April 1881 in Ruabon, Denbighshire, Wales, at Pen Rhos. Other members of the household included Daniel Davies, Ellis Davies, John Davies, William Parry and Messick Parry. Also in the household was William Parry's son Elias (age 12) from his earlier marriage. 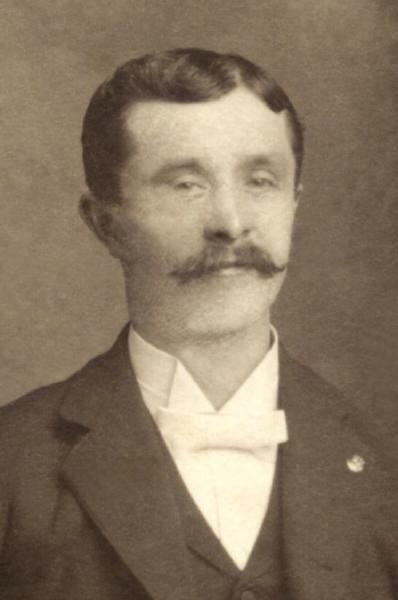 Daniel Davies arrived in Wales circa 1890, according to the 1900 census. He filed a declaration of intent to become a US citizen on 31 October 1892 at Lawrence County, South Dakota. He was naturalized on 29 October 1896 at South Dakota. He married Anna Augusta Rosengren, daughter of Andreas Rosengren and Anna Stina Larsdotter, on 7 May 1898 in Deadwood, Lawrence County, South Dakota. He was a miner according to the census. Many members of the Davies and Mattson families were employed by Homestake Mining Company. Toward the end of the Dakota Territory Black Hills gold rush (1875-1877), mining magnate George Hearst purchased one of the most promising claims in the Lead/Deadwood area for $70,000 and incorporated it as the Homestake Mining Company. Before its closing in 2002, Homestake Gold Mine was the oldest, largest and deepest mine in the Western Hemisphere, reaching more than 8,000 feet below the town of Lead. Anna Augusta Rosengren became a widow at his death. The following appeared on 23 April 1906 in the Lead Daily Call: The condition of Dan Davis continues to be critical, and his friends have but small hopes that he will recover from his attack. This afternoon, however, he was a little better than on Sunday last, but still pretty low. Daniel Davies died on 24 April 1906 at age 35 in Lead, Lawrence County, South Dakota, at 212 Miners Avenue . His death was officially witnessed by John Davies. He was interred at West Lead Cemetery, Lead, Lawrence County, South Dakota. The following appeared on 24 April 1906 in the Lead Daily Call: At 4:30 this morning Dan Davis, after an illness extending through a year or more, breathed his last, quietly passing away surrounded by his brothers and the members of his family. His death was painless and his passing was like the settling of a gently slumber upon a little child. During the long time that he had been under the care of the doctor, Mr. Davis bore his illness with courage and fortitude, and always held to the hope that he would be restored to health again. Not many months ago he went to Chicago and there submitted to an operation for relief, but it was vain, for upon his return to the Hills he gradually grew worse, and this morning his ailment, a stomach trouble, had a fatal termination. Dan Davis was born at Phosllanerchugug, North Wales, on June 18, 1870, coming to the Black Hills in 1890 and settling in Lead. Shortly after taking up his residence here he was married to Miss Anna Ross, and three children, Daniel Ross, Mariana and Charles, have been the fruits of that union. Mr. and Mrs. Davies have resided in Lead continually since their marriage, and during their residence here have made numerous warm friends, and all of them will sorrow with the bereaved wife and children in the affliction which has been visited upon them. Besides a wife and the three children, Mr. Davis leaves to mourn him two brothers and two half brothers, John, Ellis, William and Messick; two aunts and two uncles living in Lead; and two aunts and two uncles in the old country, besides the wife and children of his brother John, who are visiting with relatives there. During his lifetime, Mr. Davis was a member of the Knights of Pythias, the Woodmen, and the Miners and Musicians Unions, and had been one of the members of the Knights of Pythias band. He was a man whom everyone liked, and when he made an acquaintance he made a friend. Honest and upright, kind of heart and charitable, just in his dealings with everyone, his nature and kindliness were such that those who once formed his acquiantance became his true friend. The afflicted family and the sorrowing relatives of the deceased will have with them all of the sympathy of those who know them and who liked and loved Dan while in life. As yet no arrangements have been made for the funeral. The following appeared on 25 April 1906 in the Lead Daily Call: The funeral of Dan Davis will be held tomorrow afternoon from Miners' union hall, Rev. King of the Baptist church of Deadwood will deliver the sermon and the services will be under the auspices of the Knights of Pythias. The funeral will be attended by the Miners' Union , the O.U.W. and the Musicians' union, besides the friends and acquaintances of the family. The brothers of Mrs. Davies, Theodore and Frank Ross of Belle Fourche will arrive this evening to be present at the funeral. The story of the heroism of a Welsh boy, Private Davies, is told in a letter written to the boy's parents by a man who saw him woulded. "You may well be proud of your noble boy", he says. "On the 14th of September, at Chiog, where the Welsh have fought so bravely, after holding the position all day we were suddenly shelled by the Germans. It was suicide to stay where we were; it was, in fact, every man for himself, but in spite of this your son, utterly disregarding danger to himself, came to me where I lay woulded under terrible shell fire, and picking mu up, carried me back to cover. "Then he went off again and fetched my brother out of danger. We were in a gang; there was no doctor, and your boy stayed by us and waited on us all. "For 76 hours he worked without rest; then he went out again, tired and almost asleep, and brought back with him a wounded German. We all owe him debts of gratitude which we can never repay".